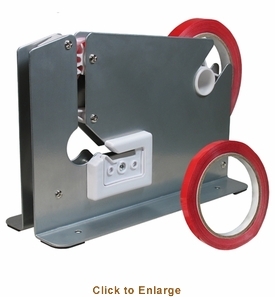 Chefs, butchers, supermarket managers and ambitious hunters will appreciate the efficiency of Weston�s Bag Neck Sealer (model 07-1101-W). The operation of this unit is very simple; the dispenser wraps tape automatically around the twisted end of a plastic bag and creates a tight seal, helping to preserve meat or other common food products, extending shelf life and keeping products safe from contamination. Purchase of this product includes a built-in bag trimmer, complete instruction manual and two rolls of red P.V.C. 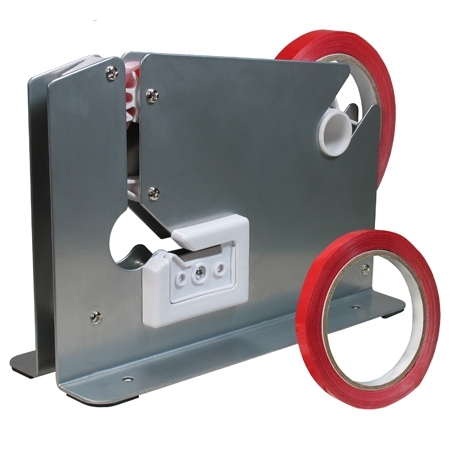 sealing tape; each roll measures .5� by 216�. Simply fill your meat bags with product (leaving enough room at the end of the bag so it can be twisted and then sealed shut), then slide the bag down so that it passes through the Tape Dispenser Sprocket, sealing the bag. After sealing the bag you can at the same time pass the twisted end of the bag down through the built in Bag Trimmer, leaving you with a neat, professional looking product to sell or store. Serious meat lovers and anyone who needs to store meat in bulk will find this to be an indispensable tool. Note: this product does not include bags.